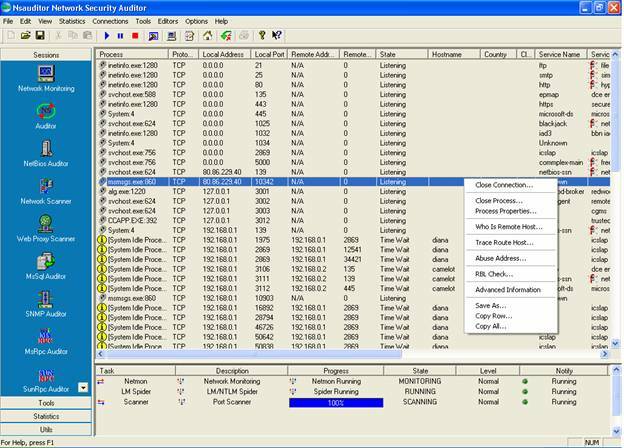 Nsauditor Network Security Auditor 3.0.2 Free Download - network security auditing for possible vulnerabilities.over 45 net tools. network security auditing for possible vulnerabilities.over 45 net tools. nsauditor network security auditor is an advanced network security scanner for auditing and monitoring network computers for possible vulnerabilities. the software checks the network using all potential methods that a hacker might use to attack it. nsauditor is a complete networking utilities package that includes a wide range of tools for network auditing, scanning, monitoring and more. you can discover network services and check them for vulnerabilities, list all tcp and udp endpoints with their associated process, discover netbios names, audit ms sql servers, scan for common adware traces and more. the program also includes real-time network packet filtering and analyzing, remote network performance monitoring, network status monitoring, web proxy scanning, password auditing, intrusion detection system based on security events log analyzer and firewall system that allows to stop internet threats and block unwanted network connections, ip address lookup and more than 45 network tools for scanning, sniffing, enumerating and gaining access to machines, dns and whois lookups, e-mail validation and http traffic generator. overall, this is a very complete package for a surprisingly low price. the product contains a built-in database of known network security vulnerabilities, which allows you to select the items for scanning and add custom entries. nsauditor can reveal and catalog a variety of information, including installed software, shares, users, drives, hotfixes, netbios, rpc, sql and snmp information, open ports. it can also audit password and security policies as well as make a variety of network attack probes, such as stealth port scans, http / cgi server auditing, registry auditing. the program can sniff and use brute-force and dictionary attacks on lm and ntlm password hashes and expose the insecure ones. nsauditor does os detection and automatically creates os fingerprints which are not included in database. reports can be generated in html and xml format. product key explorer recovers product keys from local or network computers..
spotauditor is password recovery software, recovers over 40 programs passwords..
backup key recovery retrieves product keys from old hard disk drive..
network security auditing for possible vulnerabilities.over 45 net tools..
blueauditor allows to detect, scan and monitor devices in bluetooth network..
spotmsn recovers msn messenger and windows live messenger passwords..
nsi scans network and generates reports about computers software..
game product key finder recovers product keys from local or network computers..
pkf product key finder recovers product keys from local computer..
office product key finder recovers cd keys for ms office 2003, 2007, 2010, 2013.
spotoutlook password recovery is the best tool to recover outlook passwords..
sharealarmpro monitoring network access to shared folders and shared resources..
prs is password recovery software, it recovers over 40 programs passwords..
vpn password recovery retrieves passwords for virtual private network . spotpaltalk recovers paltalk instant messenger passwords..